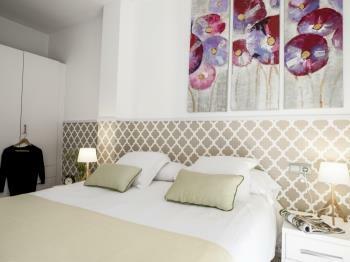 The Mozart apartment (HUTB-002384) is on the ground floor of a building located in the district of Gràcia. 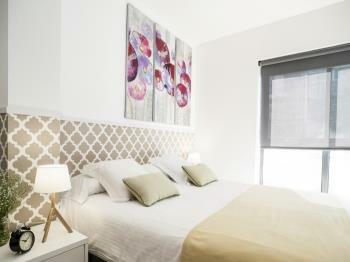 This Barcelona apartment has one double bedroom and one bedroom with a single bed and a fold out bed. Both rooms receive plenty of natural light. The living - dining area is very large and comfortable. 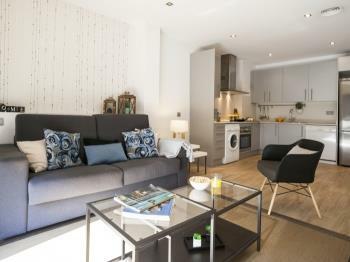 It comes with a double sofa bed, so in total the apartment accommodates up to 5 people. There is also a TV and DVD Player. 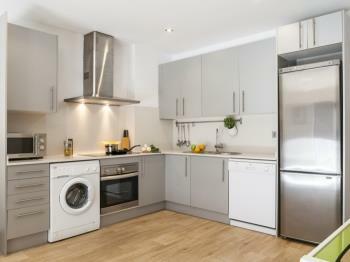 The kitchen comes fully equipped and the bathroom is spacious and it comes with a large shower. 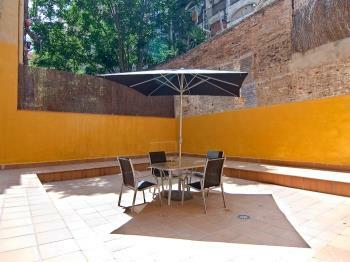 The apartment also has an impressive private courtyard with an outdoor table, a large parasol and chairs. Perfect to enjoy the good weather of Barcelona. 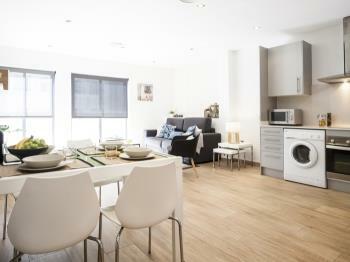 Please note: We offer other apartments in the same building. We need to plan your check-in: Please inform us about your arrival time to Barcelona and flight number if you are coming by plane. 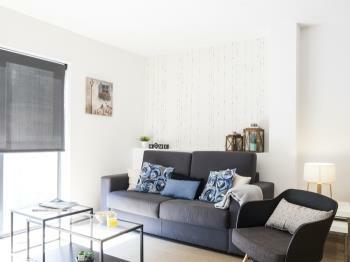 This apartment (HUTB-002384) is located on the ground floor of a building with elevator completely renovated recently. All rooms enjoy natural light. 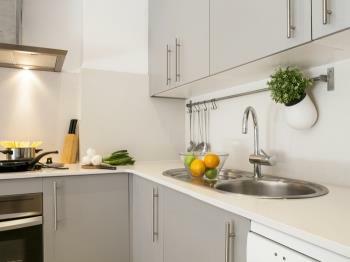 In the large central room of the apartment you will find the kitchen, fully equipped with appliances and utensils to make your stay as comfortable as possible, a table with chairs to eat and a large sofa bed. Television is in this space. The double bedroom has a very comfortable double bed, a closet where you can place your belongings during your stay and a large window overlooking the patio through which natural light comes in. The second bedroom has a single bed and a single trundle bed. It also has a large window overlooking the inner courtyard through which natural light enters. 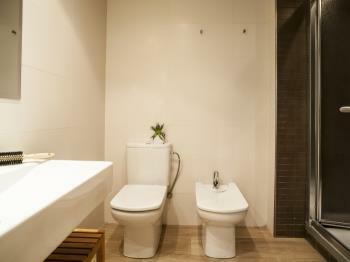 The bathroom is equipped with a large shower and has bidet. There is hair dryer. 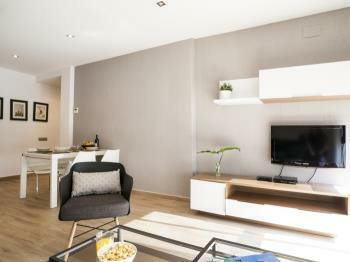 There is air conditioning, heating and free WiFi connection throughout the apartment. You will make the entrance to the apartment with a person of our team, who will inform you about the facilities of the apartment and the building as well as the area where it is located. During your stay we will provide you with a contact phone where you can call in an emergency at any time. In the charming neighborhood of Gracia you can breathe a bohemian and familiar atmosphere where the little streets are adapted to the passage of the pedestrians and they will take you to the multiple and quiet squares. If you want to increase the rhythm, you can get to Passeig de Gràcia, only 3 minutes away from the apartment, where the imposing buildings that hold the main international fashion brands will not leave you indifferent. In the area there is a great gastronomic offer. You will arrive on foot to the main monumental areas of Barcelona such as the Gaudi buildings "Casa Milà" and "Casa Batlló", Las Ramblas (15 minutes), La Sagrada Família (15 minutes), Gothic Quarter (20 minutes), etc. If at any time you need to use public transport, the closest metro stop to the apartment is Diagonal (L5 - blue and L3 - green). Also nearby you will have: metro Verdaguer (L4 - yellow and L5 - blue), the Ferrocarrils de la Generalitat station of Provença and the train station (Renfe) Passeig de Gràcia. This two bedroom apartment is located on the ground floor of a completely renovated building. It has plenty of natural light as the main rooms overlook a large inner courtyard. The kitchen, the dining room and the living room, are connected in a large space with exit to the patio. 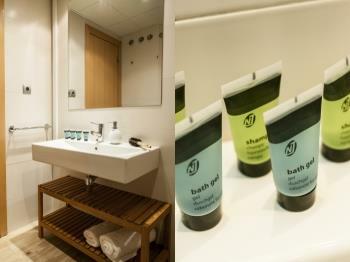 Richly equipped, it will make your stay as easy as possible. The comfortable sofa converts to a bed. The master bedroom has a double bed, a wardrobe and a window that overlooks the inner courtyard of the apartment. The second bedroom has a single bed and a trundle bed. There is a hanger and a bedside table. The window also overlooks the inner courtyard. The bathroom has a large shower, a sink and a bidet. 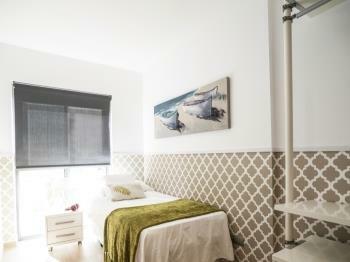 In general the apartment is quiet, has air conditioning and heating, as well as free WiFi internet connection.